Please read this Agreement carefully before accessing or using the Website. By accessing or using any part of the web site, you agree to become bound by the terms and conditions of this agreement. If you do not agree to all the terms and conditions of this agreement, then you may not access the Website or use any services. If these terms and conditions are considered an offer by WP101, acceptance is expressly limited to these terms. The materials contained in this web site are protected by applicable copyright and trademark law. WP101 provides users with access to a collection of resources, including various tools, training materials, and educational content through its network of properties which may be accessed through any medium or device now known or hereafter developed (the “Service”). You also understand and agree that the Service may include advertisements and that these advertisements are necessary for WP101 to provide the Service. You also understand and agree that the Service may include certain communications from WP101, such as service announcements, administrative messages, and newsletter(s), and that these communications are considered part of your membership. Unless explicitly stated otherwise, any new features that augment or enhance the current Service, including the release of new WP101 properties, shall be subject to the TOS. You understand and agree that the Service is provided “AS-IS” and that WP101 assumes no responsibility for the timeliness, deletion, mis-delivery or failure to store any user communications or personalization settings. You are responsible for obtaining access to the Service, and that access may involve third-party fees (such as Internet service provider or airtime charges). You are responsible for those fees, including those fees associated with the display or delivery of advertisements. In addition, you must provide and are responsible for all equipment necessary to access the Service. In consideration of your use of the Service, you represent that you are of legal age to form a binding contract and are not a person barred from receiving services under the laws of the United States or other applicable jurisdiction. You also agree to: (a) provide true, accurate, current and complete information about yourself as prompted by the Service’s registration form (the “Registration Data”) and (b) maintain and promptly update the Registration Data to keep it true, accurate, current and complete. If you provide any information that is untrue, inaccurate, not current or incomplete, or WP101 has reasonable grounds to suspect that such information is untrue, inaccurate, not current or incomplete, WP101 has the right to suspend or terminate your account and refuse any and all current or future use of the Service (or any portion thereof). You will create a password and account designation upon completing the Service’s registration process. You are responsible for maintaining the confidentiality of the password and account and are fully responsible for all activities that occur under your password or account. You agree: (a) not to share your member account login credentials with others, (b) to immediately notify WP101 of any unauthorized use of your password or account or any other breach of security, and (c) to ensure that you exit from your account at the end of each session. WP101 cannot and will not be liable for any loss or damage arising from your failure to comply with this Section 4. By selecting a product or service, you agree to pay WP101 the one-time and/or monthly or annual subscription fees indicated (additional payment terms may be included in other communications). Subscription payments will be charged on a pre-pay basis on the day you sign up for an Upgrade and will cover the use of that service for a monthly or annual subscription period as indicated. Payments are not refundable after 30 days. Unless you notify WP101 before the end of the applicable subscription period that you want to cancel a subscription, your subscription will automatically renew and you authorize us to collect the then-applicable annual or monthly subscription fee for such subscription (as well as any taxes) using any credit card or other payment mechanism we have on record for you. Subscriptions can be canceled at any time by clicking the link on your Profile page, or by submitting your request to WP101 in writing. 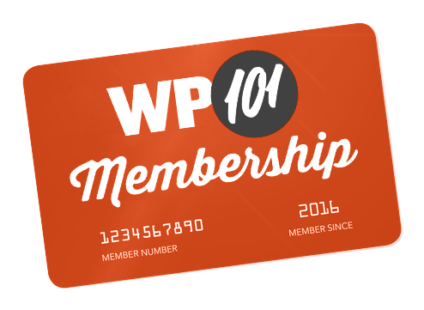 By signing up for a membership account you agree to pay WP101 the applicable setup fees and recurring fees. Applicable fees will be invoiced starting from the day your services are established and in advance of using such services. WP101 reserves the right to change the payment terms and fees upon thirty (30) days prior written notice to you. Services can be canceled by you at any time by clicking the link on your Profile page, or submitting written notice to WP101. All subscriptions include access to support via the members-only Q&A Forum. “Support” means the ability to make requests for technical support assistance via the forum at any time (with reasonable efforts by WP101 to respond within 3-5 business days) concerning the use of the WP101 Services. All support will be provided in accordance with WP101 standard services practices, procedures and policies. This license shall automatically terminate if you violate any of these restrictions and may be terminated by WP101 at any time. Upon terminating your viewing of these materials or upon the termination of this license, you must destroy any downloaded materials in your possession whether in electronic or printed format. The materials on WP101’s web site are provided “as is”. WP101 makes no warranties, expressed or implied, and hereby disclaims and negates all other warranties, including without limitation, implied warranties or conditions of merchantability, fitness for a particular purpose, or non-infringement of intellectual property or other violation of rights. Further, WP101 does not warrant or make any representations concerning the accuracy, likely results, or reliability of the use of the materials on its Internet web site or otherwise relating to such materials or on any sites linked to this site. In no event shall WP101 or its suppliers be liable for any damages (including, without limitation, damages for loss of data or profit, or due to business interruption,) arising out of the use or inability to use the materials on WP101’s Internet site, even if WP101 or a WP101 authorized representative has been notified orally or in writing of the possibility of such damage. Because some jurisdictions do not allow limitations on implied warranties, or limitations of liability for consequential or incidental damages, these limitations may not apply to you. The materials appearing on WP101’s web site could include technical, typographical, or photographic errors. WP101 does not warrant that any of the materials on its web site are accurate, complete, or current. WP101 may make changes to the materials contained on its web site at any time without notice. WP101 does not, however, make any commitment to update the materials. WP101 has not reviewed all of the sites linked to its Internet web site and is not responsible for the contents of any such linked site. The inclusion of any link does not imply endorsement by WP101 of the site. Use of any such linked web site is at the user’s own risk. All logos, product, and service names related to these TOS are trademarks of WP101 (the “WP101 Marks”). You agree not to display or use in any manner the WP101 Marks without prior written permission. Any claim relating to WP101’s web site shall be governed by the laws of the State of Texas without regard to its conflict of law provisions.